Thoughts on all that spandrel? I think the colour scheme and proportioning are absolutely perfect. This is easily the nice project either built, under construction, or proposed in the city asides from maybe Alldritt’s tower. Hopefully it's quality spandrel that is durable, won't fade, etc. I do think this tower is exceptional, and a few more spread around would be great. Bingo. The gap being filled was the purpose of this shot. Last edited by Big Bird; 24-02-2019 at 02:52 PM. The only problem I have with this and the Ulitma's exterior is that the balconies are not painted. To be honest with you I think exposed looks better over the long term. But that’s just my own opinion. Painted surfaces in this city don’t hold up. Painted looks finished, but does need ongoing maintenance. Considering the colour schemes used on these buildings, exposed looks just as finished and matches better than say, a white finish look would. Sometimes less is more. Ya, I prefer exposed as well. Interior and out. ^amazing, thanks! I love how skinny this building is going to be. 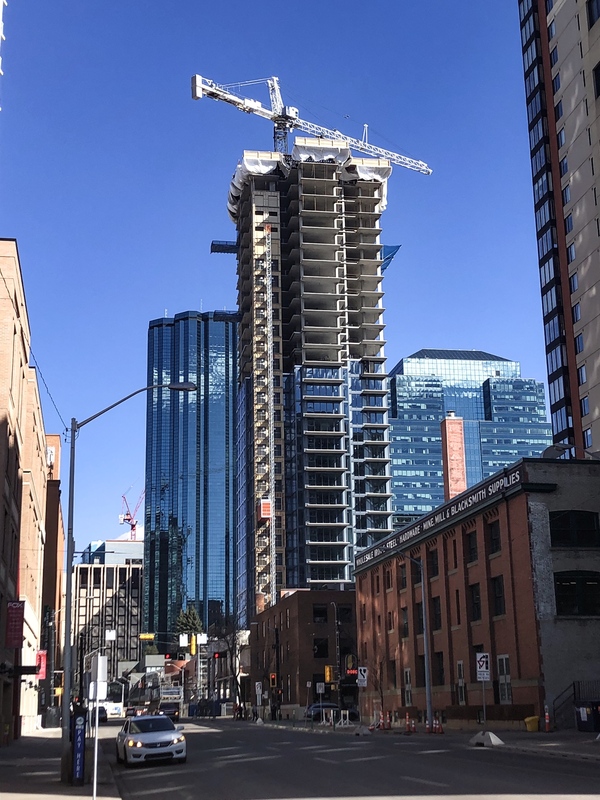 That really demonstrates the importance of this project as a connecting piece between the CBD and the 104 Street infill. starting to get some real height to it now !! Back to Ency, she is really taking form now. On the 26th so another 18ish to go. 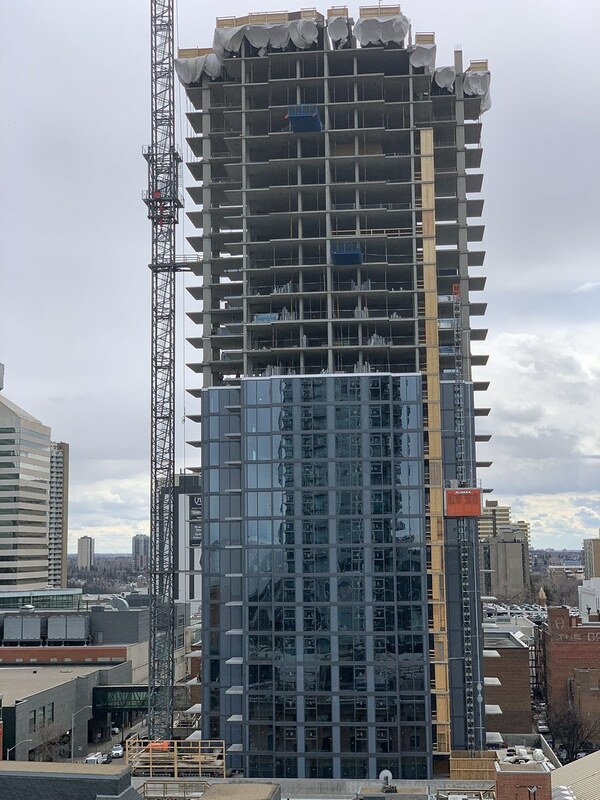 Looks like the elevator core form being lifted there. So cool! isn't there tax on top of those prices? I'd say that's not too bad at all. I'm not a fan of the Encore floor plans, all units you enter into a hallway and most have a column in the living area. Just turn that column into usable entity like float shelving unit all around the column. Start from 2 feet up and use the entire column. Decorative objects at the higher unreachable level and more functional lower; many things can play off a column. The 973 sq. ft. 2 beds/2 bath are my favourite layout of any new building right now. I'm not exactly aware of how the condo market works, since its always been apartment living for me and mine. I doubt these are not rentals where you put up the first month and last month (as deposit) I'm guessing that these units will be priced at ~ $300,000 to start and then $466 month is condo fees/tax/crl fees etc. Other factors I'm sure are up for consideration like first time home owners grant for millennials/middle class families/newcomers etc. Other considerations I'm missing? I am more concerned with it holding up value and condo fees. I already live in a stick built building and am not pleased. Price did not hold at all. I might be stuck with it now for 10 years. Is there a CRL overcharge to the property tax on top of the regular property tax? No, the CRL just means that the property tax of new construction goes into the CRL fund, not to the city. The CRL funds can only be spent within the CRL area, including paying off the arena. The 1501 sq. ft 2 beds/2 bath are my favourite. So much so that when we probably move back to Edmonton this fall, we'll consider a deposit on one. The building is 80% sold last I heard and that was months ago, their currently having a sale to sell as many of the remaining units. Given the size of that unit it might be a popular buy, with only the lower floors remaining. ^Ya I do too, and those could easily be made into a 3 bedroom. I would be a little concerned about overheating facing south, you'd have to have blinds. Correct me if I'm wrong but the CRL is paid at the consumer end ie condo owners living within the CRL boundry/downtown core. The CRl then goes to the CRL fund to help not ONLY pay for the arena but to help fund NEW building projects. We're paying ~ $920 for a 2 bedroom here in Clareview in a walk up. I think its between 900-1000 sq feet. The CRL is not funded by new construction necessarily, it's funded by the "tax uplift" of development downtown. Meaning if pre-CRL my tax assessment was 10K and post CRL it's 15K, 5K goes into the CRL. The original 10K still goes to general revenue. This is an over implication but that is more or less how it's supposed to work. In this case, it would be the difference between the sum of all the commercial/residential/parking space property taxes from the tower and the previous property taxes paid for the previous surface parking lot. Should be a nice bump to the CRL. Yup, digging those as well. Used to be 70% old. Not anymore. Many who put deposits down did not qualify for mortages. There will be blood. I held off. Last edited by Safir; 25-03-2019 at 03:09 PM. The absolute price is OK, but they jacked up the advertisement price in the paper to make it look like the discount you were getting was much steeper than it actually is. Sneaky little hobbitses. They wus sneaky but I wus sneaky too. Don't make blow the whistle publicly. I recognise 'caveat emptor' has never been abolished as a principle of commerce, and do not wish them ill.
A buddy of mine bought the special unit they were selling yesterday. He said they had about 50 people put down deposit cheques with unconditional offers...they all the names into a draw, and he "won"
Wow! I suspect the partial outcome of the tower so far has caught attention? If indeed that outcome was true, I can't help but have high hopes for their 106st project. Up to 175 m sure couldn't hurt the skyline; and, with their proven aesthetic, I'm very excite! Why don't you ask for their December pricing sheet? Well, probably because the website price list is October 2018 AND the list prices shown in the newspaper ads line up exactly with that... that's why. Nothing very sneaky (on their part) about that. I mean, developer brings out a property with one price list for opening day and over the next few years as sales occur and the construction begins, tries to increase prices to improve their returns - I guess you could be paranoid and read something horrific into that except of course that it's what every developer would try to do. What any sane business would try to do. But never mind those facts Gollum, what pray tell does your non-published December pricing sheet show ? It shows that it is March of the Current Year. Continues to grow, have to now step back to get the top floor in frame. My picture from this afternoon. Great contrast between those three. 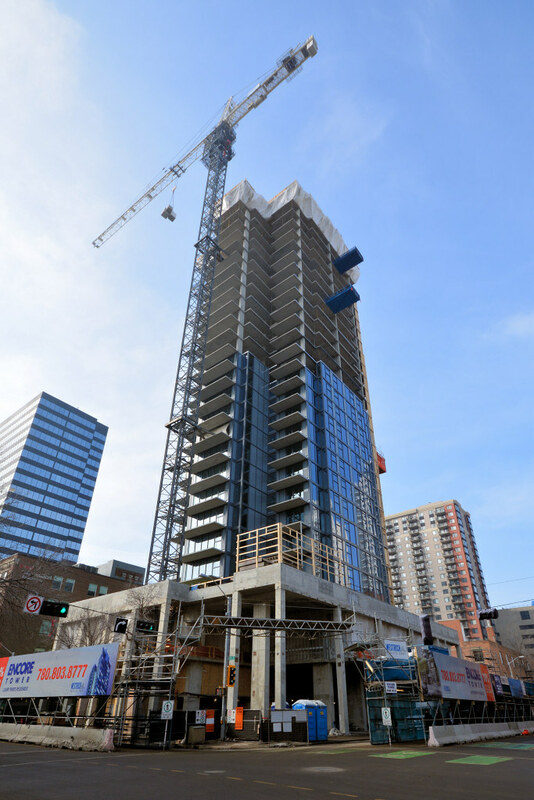 How many more floors to go, looks sixteen-ish? 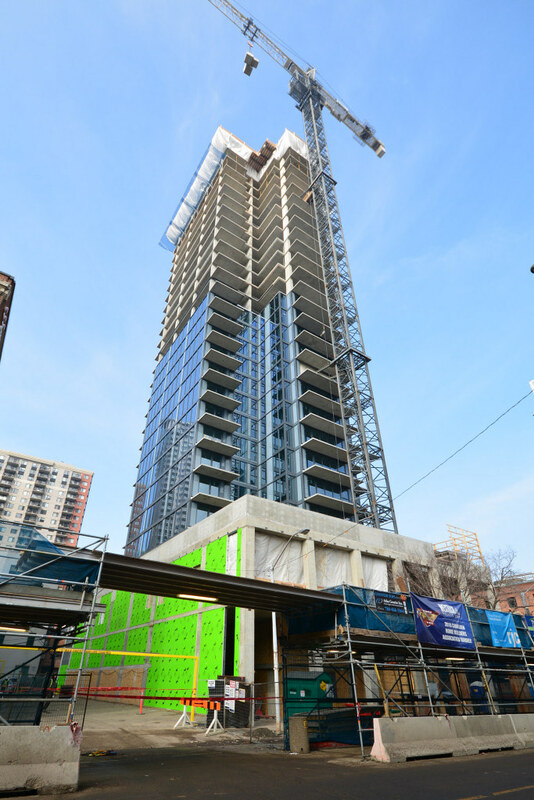 Encore is a 43 story development as in the header above. They seem to be on floor 30 right now. CTV show the construction & crane in the backdrop on their live webcam of the city centre on their news show. 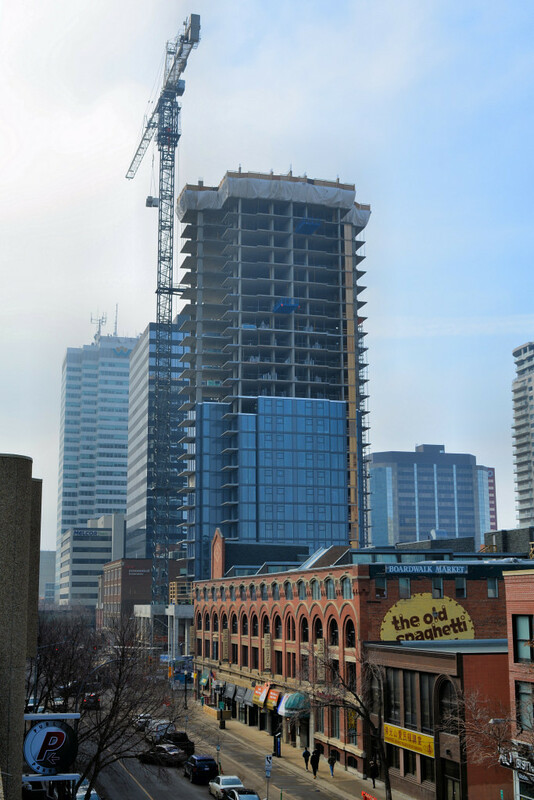 The building is coming along nicely - and from that vantage point Encore will be visible. (it is now). I am not sure which tower their webcam is mounted on Saskatchewan Drive. Although I would like to see it wrapped into that second tower that was planned. Getting my snaps in before I leave Edmonton next month. I don't think so. This ONE OF THOSE that now must be protected at all costs. I have lots of scope should you need to wash your mouth... lol. Off topic, is there enough space and separation for a condo in front of Commerce tower spanning a wide south elevation and super skinny west? Let say the wide side would span from 102 street abuting the antique, and built out the podium area on 101st where the gate by CIBC is? Last edited by ctzn-Ed; 08-04-2019 at 06:32 PM. ^^LOVE that angle and the gap it fills. I think I saw you out today taking photos. Did you see me? A bearded derelict with a shopping cart full of bottles gunning for the Quasar Bottle Depot? ^That last photo looks great... but it does make me wish that Manulife 2 would get built one of these days, would be great to get that gap filled. Oh my God!!! That hole is just begging for Manu 2!!! That wouldn't have been noticed if that picture didn't popped up; it is also the least of my concerns. Who owns the parking lot just north of fox one? Looks like a prime spot for another tower, also would complete that corner and compliment the Wexford tower. Have we heard anything on it? A local lawyer and no plans. Is that person the owner of the parkade as well? Waiting for "the right time" I guess. I wouldn’t develop it if I were him. It’s a secure and safe source of revenue. Non-accessory parking lot... days numbered. Last edited by IanO; 14-04-2019 at 08:25 PM. Non-accessory parking lot... days numbers. Why? 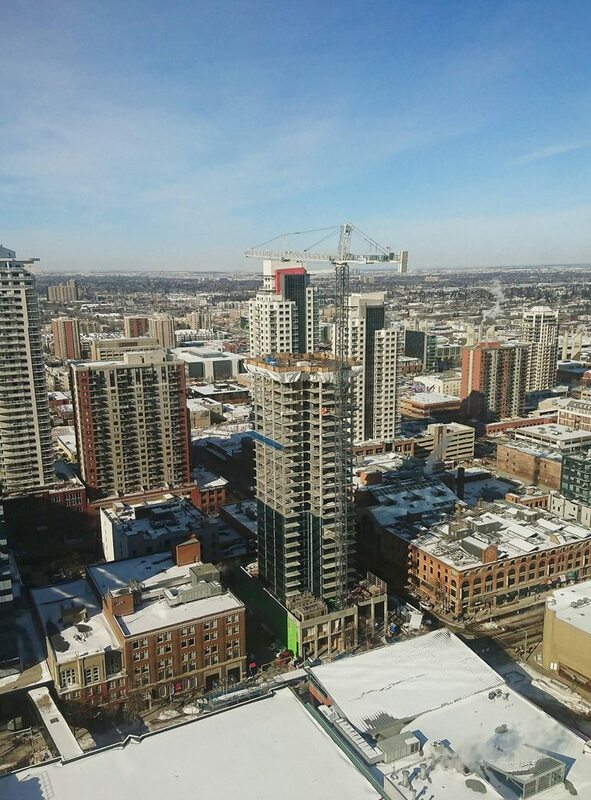 It’s a secure revenue stream localized in one of the most desirable neighbourhoods in the city. I’d counter that considering the market (without having ran any numbers), developing the lot is a greater risk. How about encouraging more infill development instead of validating a landlord's excuses for a surface parking lot? I’m not validating any behaviour, I’m stating economic facts. Not to mention that the property owner has every right to operate the land as he sees fit so long as the lot is operated legally and within the city’s bylaws. Discretionary use in the HA zone. We are seeing fewer and fewer non-accessory renewed, which generally leads to a higher and better use/development or a sale then development. I suppose how you look at it. There's a glut of non-accessory parking in downtown. I'd argue that as less lots become available, that the existing lots become more economical. Especially ones so close to both the arena and financial districts. I could be incorrect on this, I'm not a zoning expert, but I wouldn't hold my breath expecting a lot to be developed just because neighboring lots are trending that way. It really depends on the owner's intentions and sentiments. He could be quite comfortable with his circumstances. Absolutely, but point being that every 5 years that permit has to be renewed and we have seen the COE not renew non-accessory lots. Yup. How many though operated legally and within their respective bylaws? The city has definitely started clamping down recently on ‘illegal lots’, I’d be deeply concerned though if they were trying to push owners out of what is a legitimate business ran and operated properly. You are stating economic assholery, I don't think owner needs the extra revenue. All surface parking lots should be banned. Period. I think you’d feel differently if it was you owning the land and operating a business within the confines of the bylaws, and the city forced you to sell because of a negative stigma regarding what is an essential business. Last edited by Stevey_G; 15-04-2019 at 08:23 AM. Concur... slippery slope, but certainly those without permits need to be addressed. Might be a business, but I'd hardly call it essential. Unfortunately, a lot of Edmontonians would disagree that that statement. Just wish that the CoE would bring some strict aesthetic requirements to downtown non-accessory parking lots permits. I.e. x% has to be converted to green space, and every permit renewal on the 5 year cycle has to add an additional x% to be able to qualify. At least then some relief would be provided from the ugly and there would be some incentive to use the lots for other purposes. Of course, the owners would never maintain the green space, but it's a nice thought.